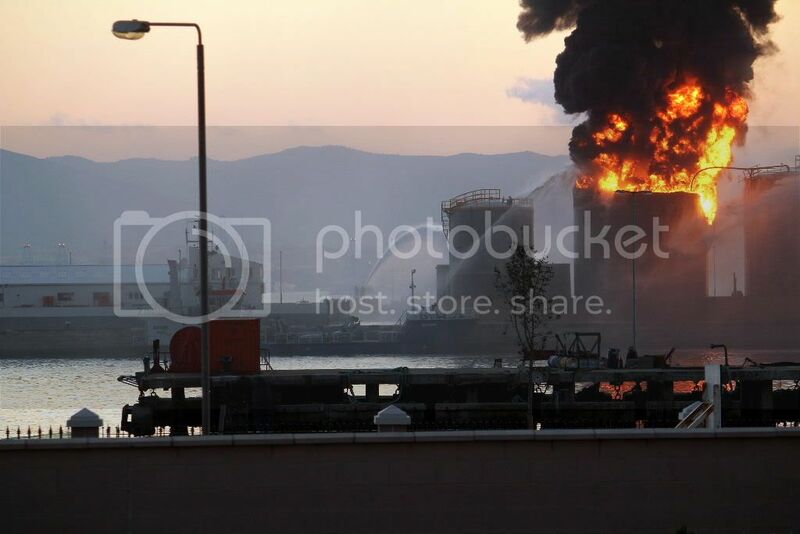 GIBRALTAR PORT - 310511: At approximately 1535, Gibraltar was rocked by three explosions. 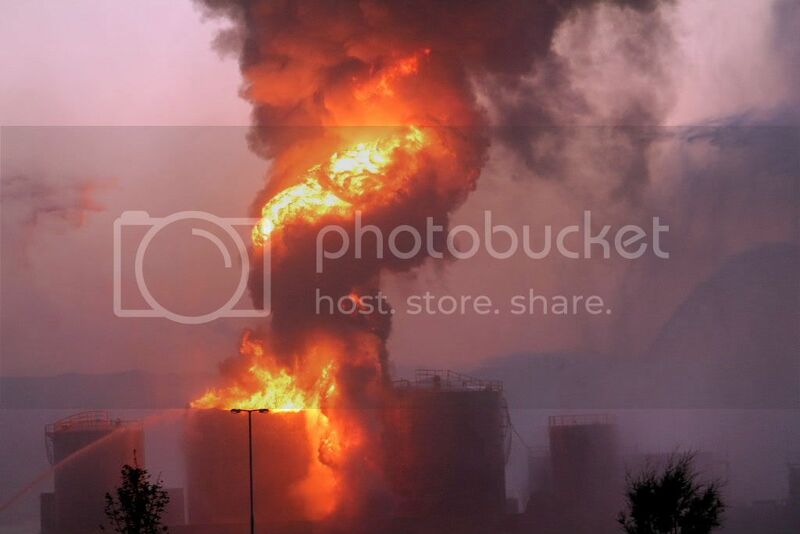 One of the two Sullage Tanks (holding tanks)on the Eastern side of the Western Arm had exploded and was on fire. 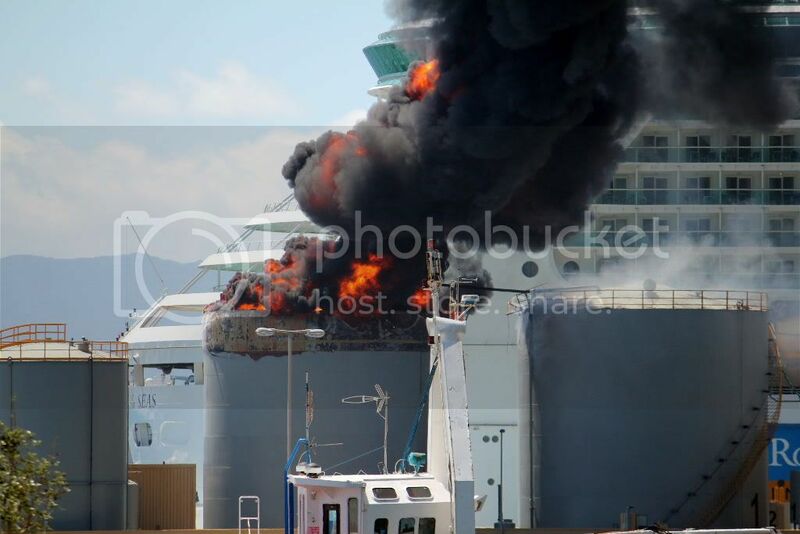 Of very grave concern was the fact the INDEPENDENCE OF THE SEAS was moored (stern) parallel less than 50 metres from the explosion. Within five minutes she had released her mooring ropes and proceeded out of the berth unassisted but with the Pilot onboard. The ship had been making ready to leave and all passengers except two were already aboard...and so was the Pilot. Immediately the combined Fire Brigades (City and Defence) mustered resources to the scene after a general recall had been intiated. 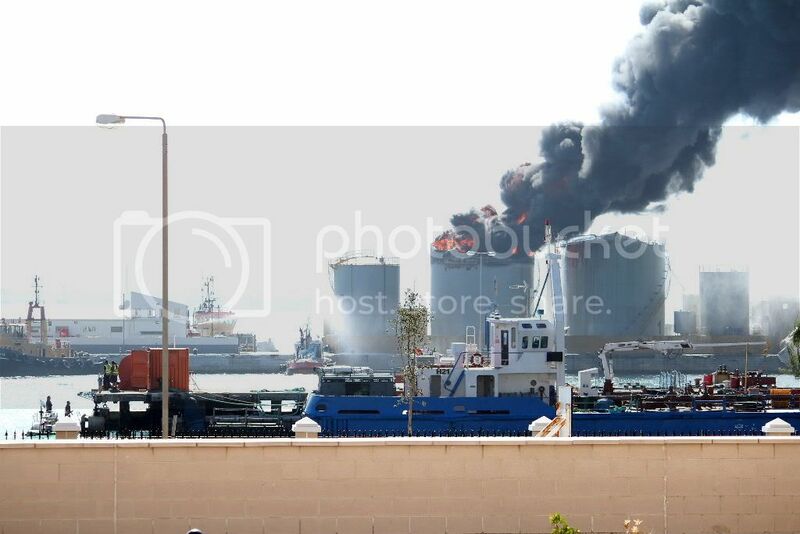 The Police (RGP and GDP) were also on recall as was an element of the Royal Gibraltar Regiment due to the fact that a terrorist attack could not be discounted in the early minutes of the explosions. 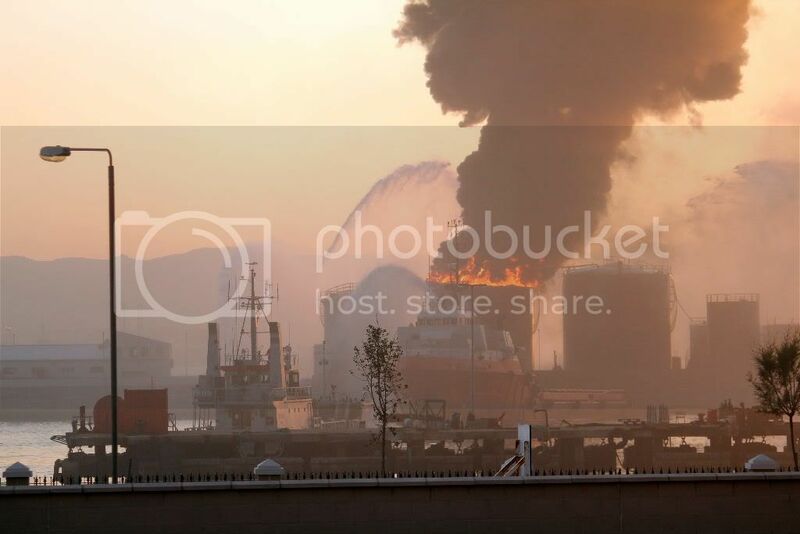 Acoording to the last official statement issued at 0030 this morning, it would appear that welding was being carried out on the tank when it exploded. The top or cover of the tank was hurled into the air for hundreds of feet and it then fell on part of the mole and the water. Three casualties on land have been reported, one seriously injured (burns) and two suffering minor injuries. The burns victim was immediately taken to St Bernard's Hospital to be assessed and stabilised and then taken to Seville where they have a dedicated Burns Unit. One of the two other casualties, a duty Policeman, has been praised by the Chief Minister for exceptional courage when the former made a valiant attempt to rescue the seriously injured man in the vicinity of the blazing tank, and thus prevent further injury and possibly death. 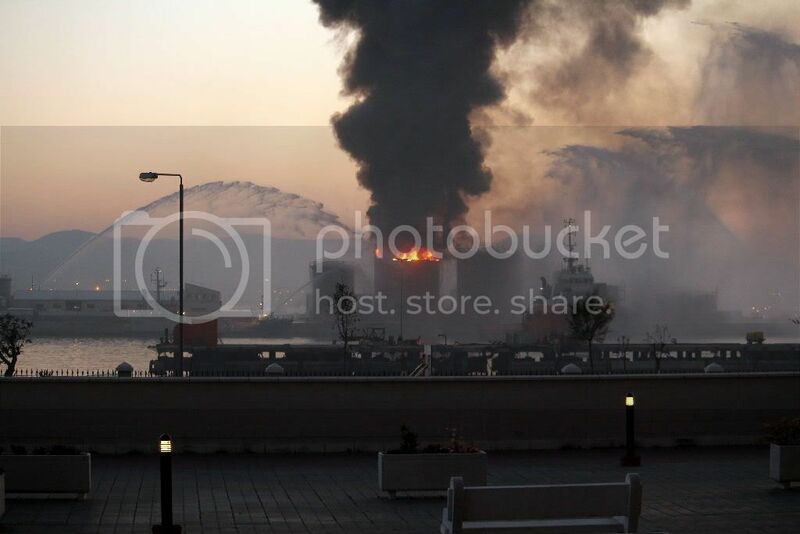 Harbour craft started to converge on the seaward side - tugs SUN SWALE, ROOKE, ANA and RED SEA FOS - and started pouring water on the rest of the tanks to cool them down and prevent another explosion and possible extension of the conflagration. 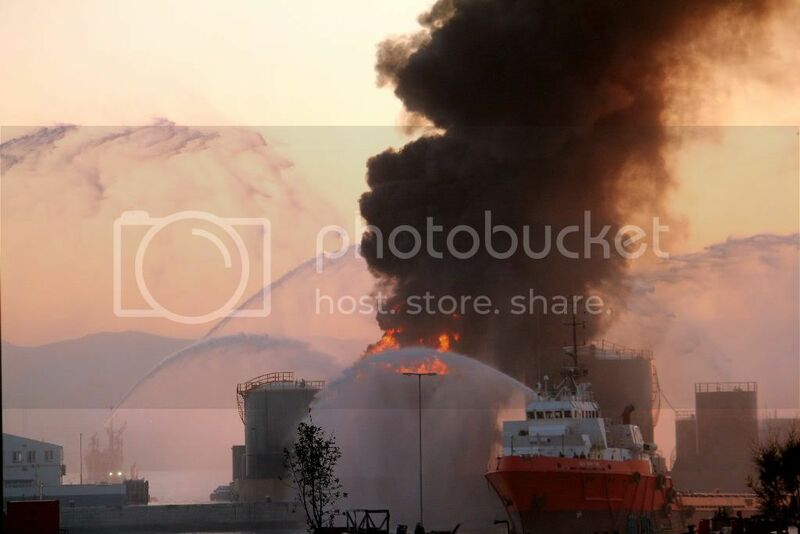 On the landward side hoses had been rigged as well as the Airport Fire Tenders with their cab-mounted water cannons. However, the heat was tremendous and there was the risk of the fire spreading. The combined brigades were moved to a safer distance. 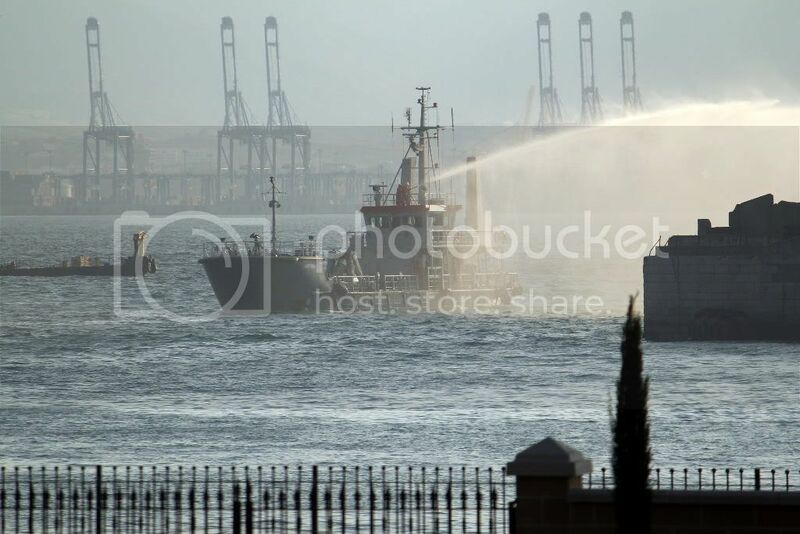 Soon it was realised that more assistance was needed, and three tugs from Algeciras arrived and started spraying the area. These were LUZ DE MAR (Salvamento Maritimo), V.B. SCIROCCO and SERTOSA DIESISIETE. 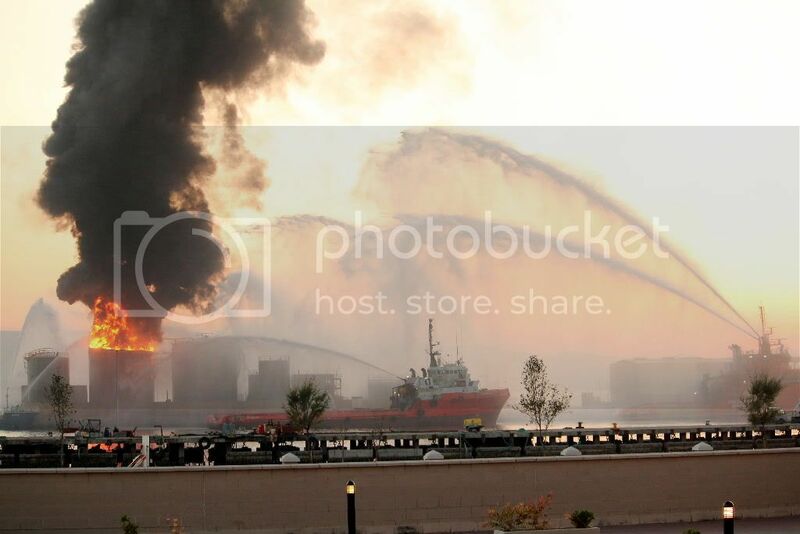 Additionally the Oil Pollution Vessel NEPTUNE was also in port working for Steelmac, and also joined the firefighting. 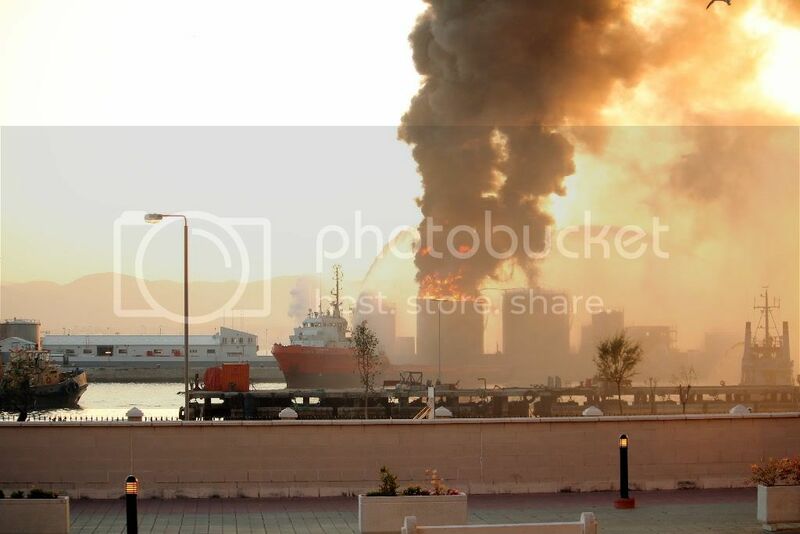 As the situation worsened, all harbour craft and one tanker (SP DUBLIN) were removed from their berths inside the harbour and moved elsewhere to safeguard them in the event of the sludge on fire starting to pour into the sea. 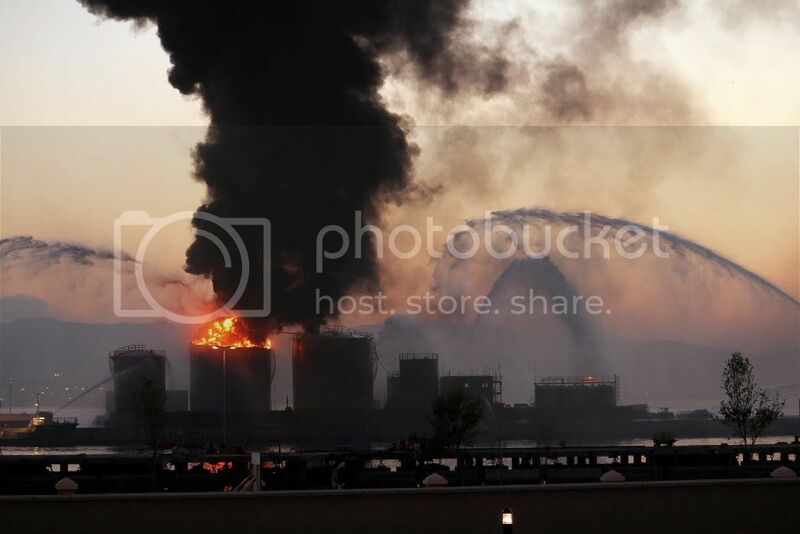 Oil Booms were also deployed. GBC-TV has provided live coverage with a fixed camera from shortly after the incident occurred. 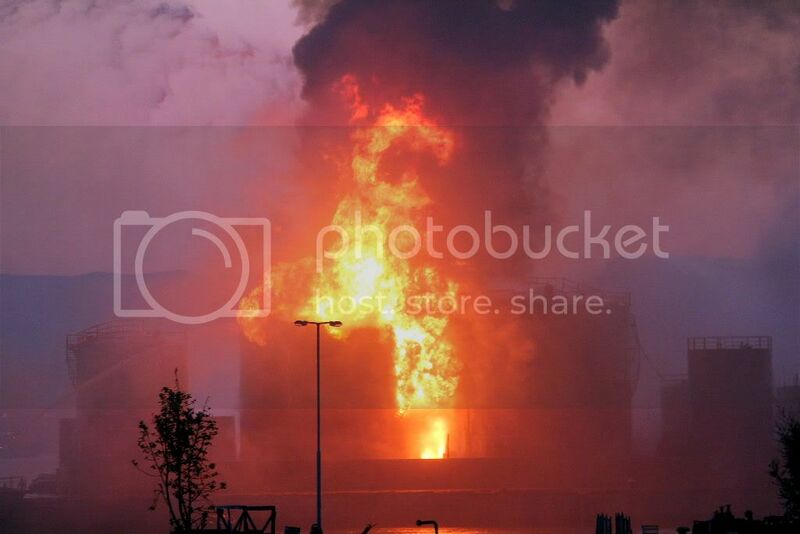 At present no flames can be seen although there is still evidence of tons of water being poured onto the site. The pictures that I took were from the ground floor podium where I live. Acrid smoke everywhere sometimes proving a surreal backdrop as the weak afternoon/evening sun tried to outshine the blaze. As expected, traffic diversions in place to assist the Emergency Services geting to and from the Westerm Arm caused a massive gridlock. Mobile networks were also swamped as people started calling each other for updates. All residents (including me!) 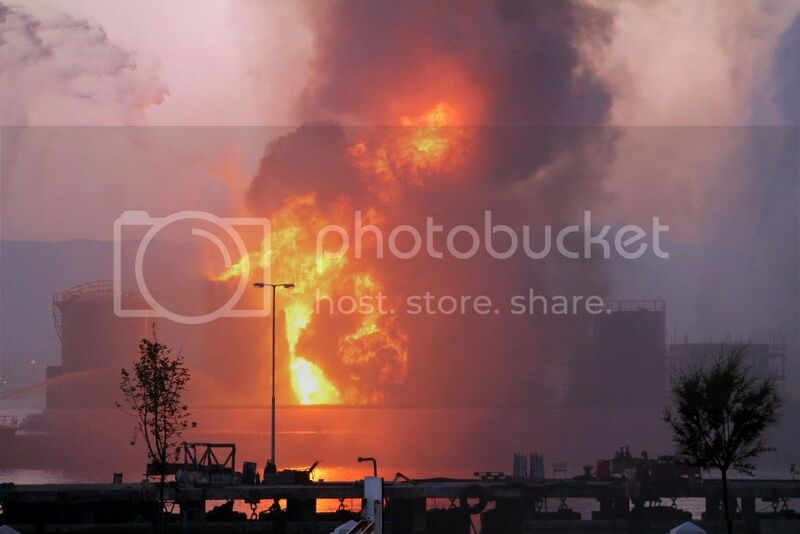 who live facing the incident were advised by the Police on evacuation procedures should these be necessary as well as precautions should the other tank explode. The situation was all the time monitored and updated. By 2200 traffic was circulating as normal and the exclusion zone around the sea-facing blocks lifted. A COBRA type meeting (called C3) was immediately convened in the Chief Minister's Incident Room as soon as the explosions occurred as the incident was classed as "Major". The latest on the INDEPENDENCE OF THE SEAS is that up to a dozen passengers suffered minor injuries. However, there is not much detail on this. There is also no information on structural damage to the ship. The two passengers who were left behind will be flown to the next port of call of the ship. 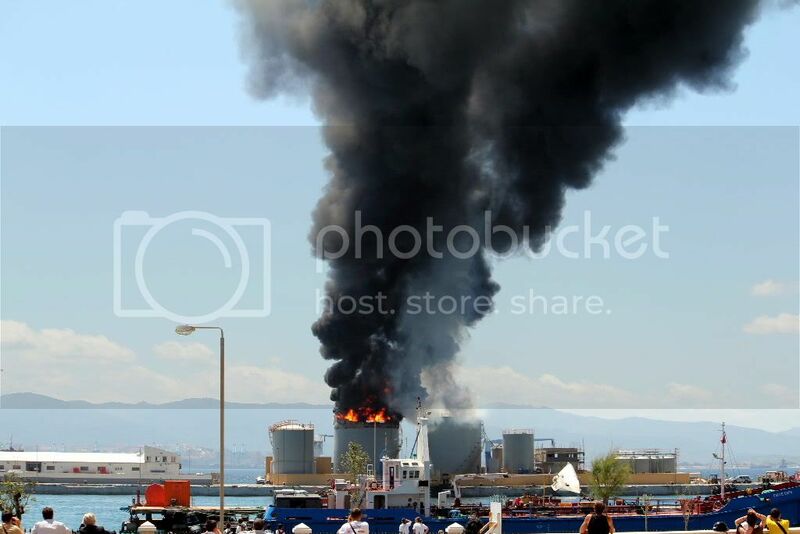 Bad incident Francis, but seems dealt with in a most professional way, as we would expect at Gibraltar. 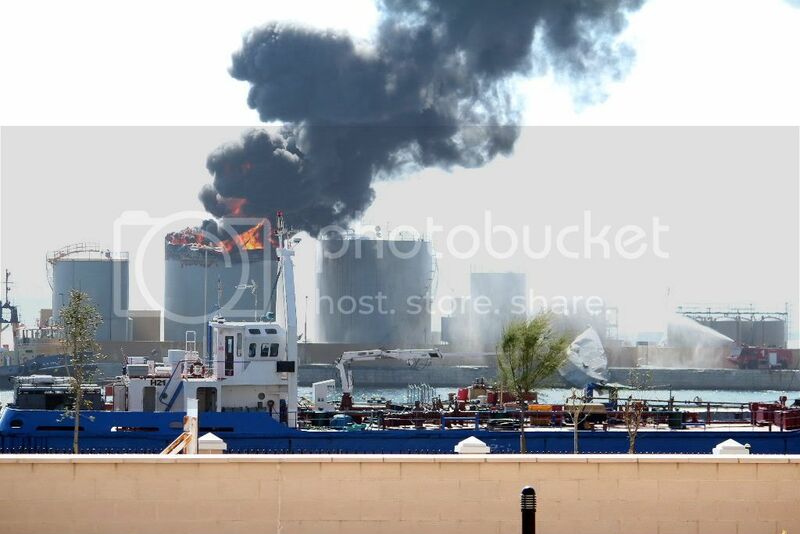 Hope from your latest comment that all under control now and no danger to the other tanks or surroundings. An excellent report and set of photographs Francis. fantastic stuff. Do CNN know about you ?? 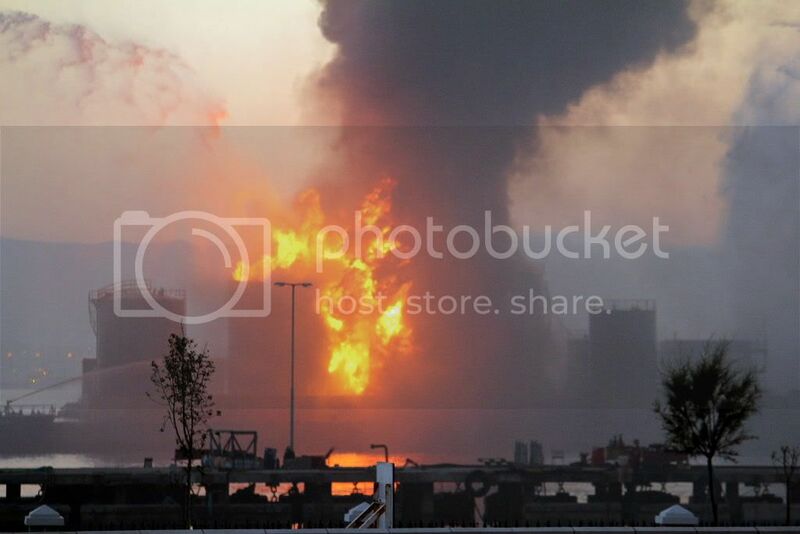 On a serious note, I hope that all is now under control and that there are no serious injuries. As Alasdair said, excellent report backed with superb, albeit scary, images, Francis. 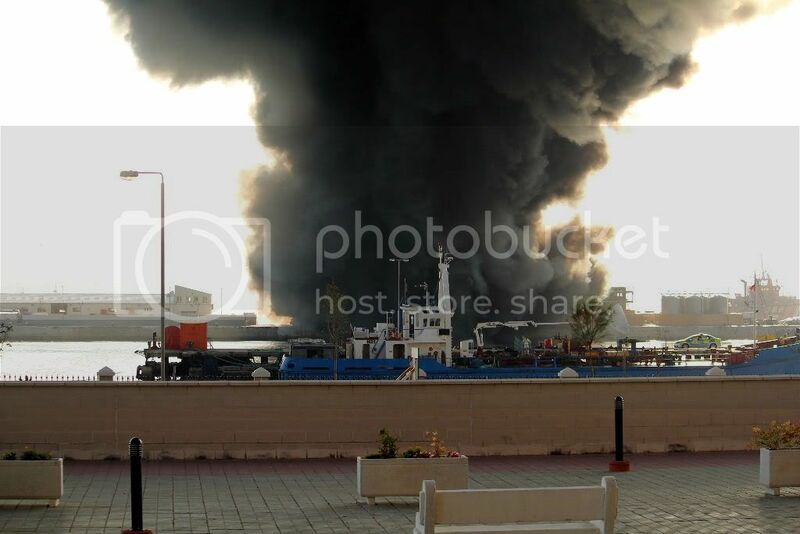 Quite a large scale incident by any standards but for Gib it must have been something else. Great that it never spread and there were no further explosions. Bound to be a major investigation now on why welding was taking place in such a hazardous area that was clearly not gas-free. Thanks gents! Not a nice assignment by any means, but if it does happen, well, out comes the artillery and we try and capture the moments. 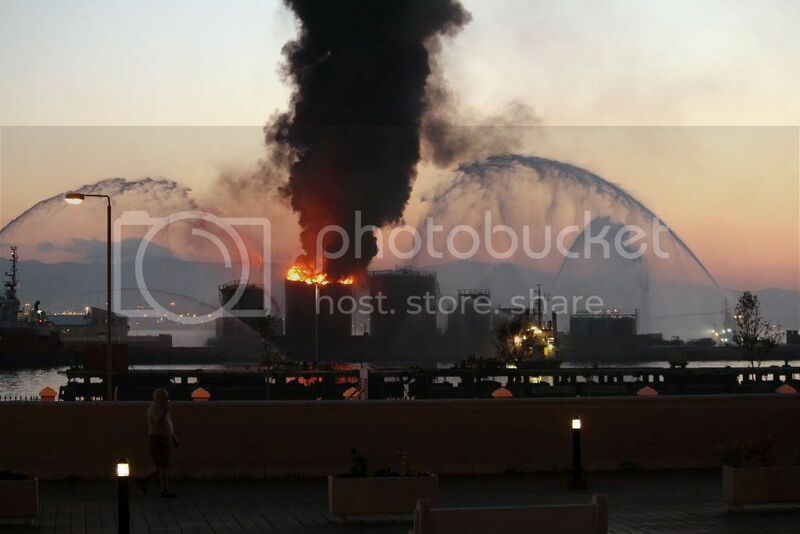 There is no doubt that the professionalism and knowledge of fire fighting came out very well. 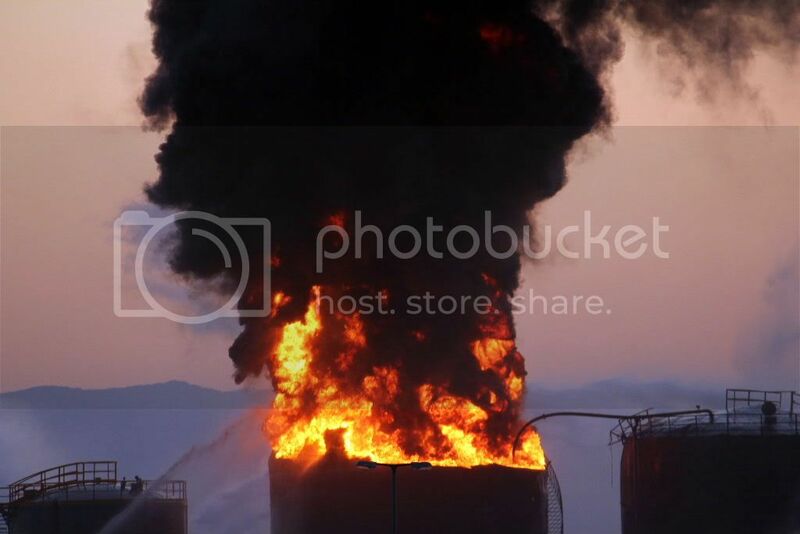 Initially the " boots on the ground" had to assess what was happening, and in the first instance begin the cooling process to avoid the fire crossing over to the other tanks. 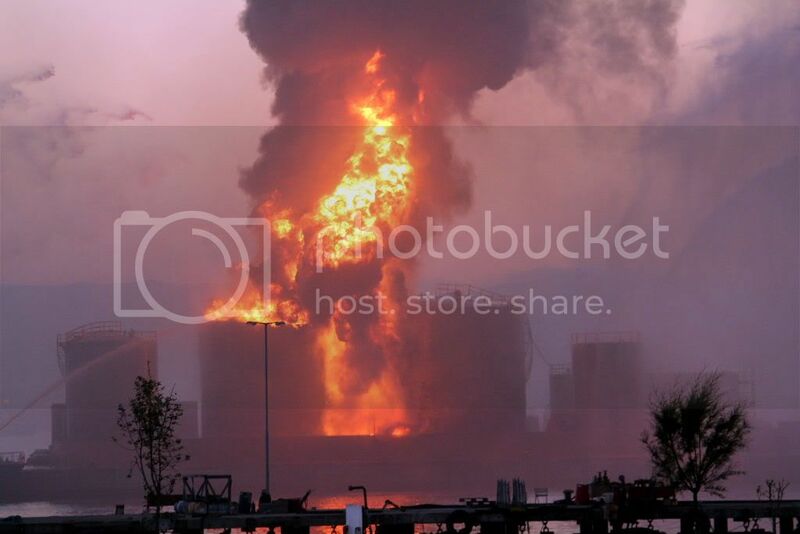 The danger of explosion had receded on that particular tank as the top had blown off. 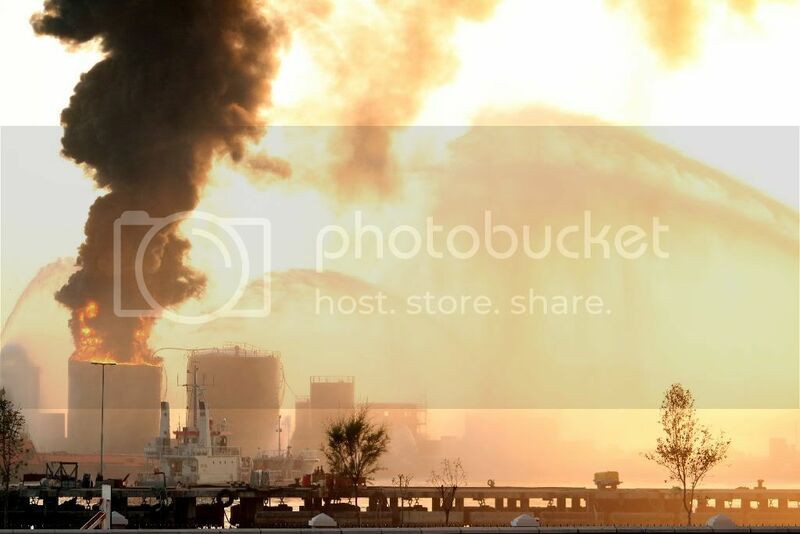 However, there might have been a pocket in the sludge with a higher or different explosive nature.The heat was also becoming unbearable.Thus the firefighters were withdrawn to a safe distance and the cooling of the area passed over to the tugs and specialists vessels. At one point there was considerable risk of Tank No2 also blowing up, thus the greater effort to cool it down with the maximum of water cannons/ hoses whilst the other tanks were also cooled on a slightly lower scale. At least this is what I (think I) saw from my vantage point! 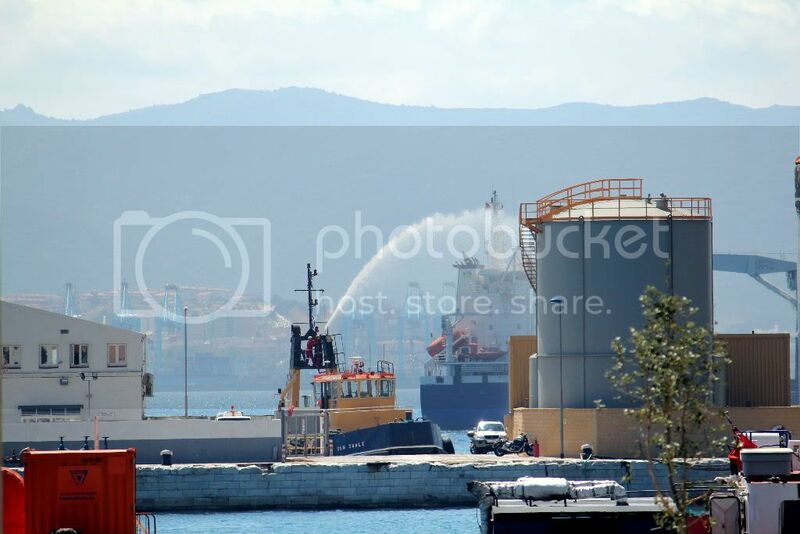 From the outset, the official release by the Government pointed to a welding scenario, but did not go far enough in questioning whether the tank was full, half full or even certificated gas-free. I have to agree that it is strange comment to make - gases and flammable liquids certainly do not mix with sparks! 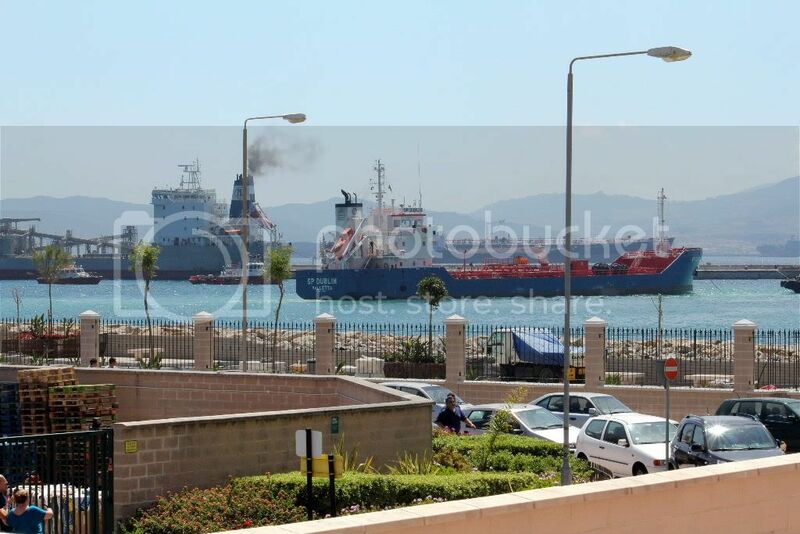 Notwithstanding that there have been tanks (fuel and sullage) for a number of years without any problems, it is certainly questionable whether you would allow cruise ships to berth alongside a potential hazardous location. I am certain that they will need to review the practice. I always understood that certain activities carried out on the moles which include welding, cutting etc were stopped completely when liners were in port. 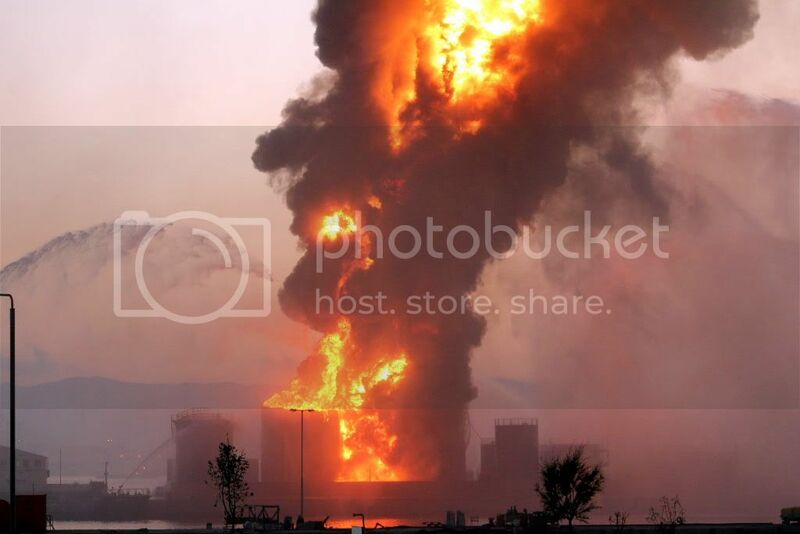 I have asked friends of mine who work in the Port area and they confirm this. It is also common sense from an outsider's point of view. 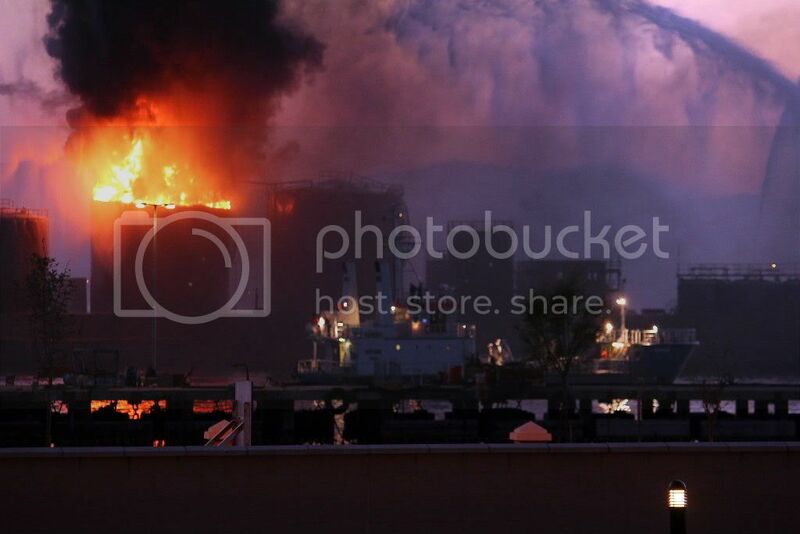 As regards the fire itself, it appears that by 0400 it was seen slowly dying away - one last whoosh and it was all over. However, cooling of the all the tanks continued until nearly midday today. Let us hope that the enquiry is swift and thorough and placed on the "lessons learnt" priority board. Although a bit late, here is a couple of pics taken by myself and my son. 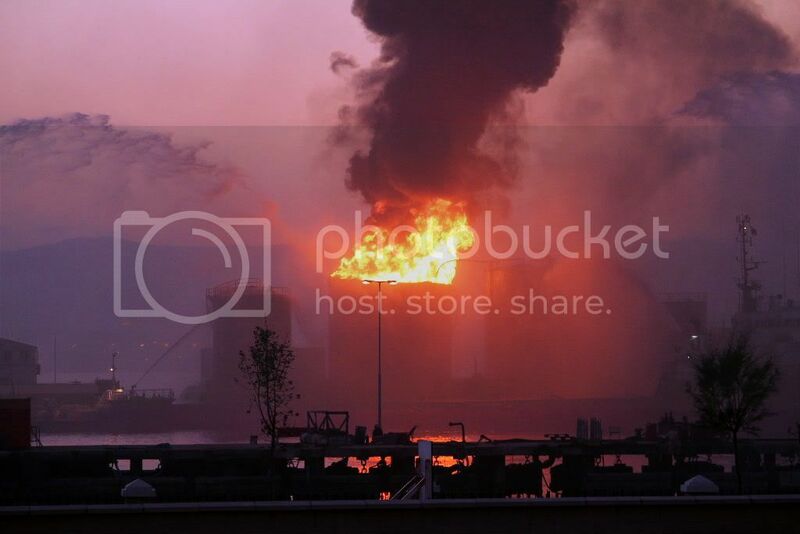 070611: In the aftermath of this incident, it has become evidently clear that fuel and/or sullage tanks as at present on the Western Arm, are out. The mole will more than likely be for the exclusive use of cruise ships. 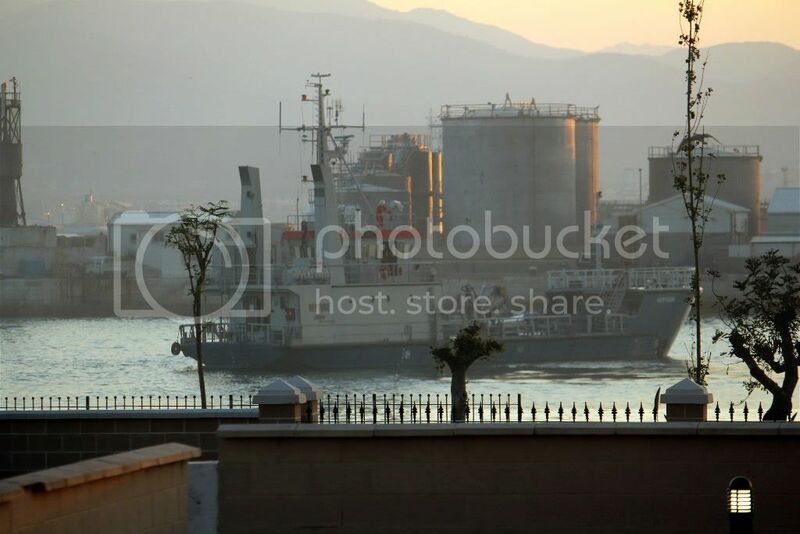 However, consideration must be given to other shipping that use the inner harbour: Tugs awaiting orders, small General Cargo ships and Yachts that come in for fuel, and obviously unloading of machinery or goods that require berthing either on the Western Arm (East) or the jetties. The problem is that the Port in general suffers from lack of berthing space...either that or we are promoting too many activities without the necessary infrastructure including premium safety resources. Thus, if we are to consider the use of the Western Arm as exclusive for Cruise Ships, we might be tempted to use the Detached Mole for fuelling purposes. This will entail laying fuel pipes underwater across the North Entrance. Equally there would have to be an accommodation block built on the mole to house those involved in fuelling. We have to remember that this mole is an island, and access is only by harbour launch. What about water supply to shipping? All water supply points are at present on the Western Arm and jetties, so I suppose that this is considered a safe commodity and does not impinge on cuise ships berthing there. 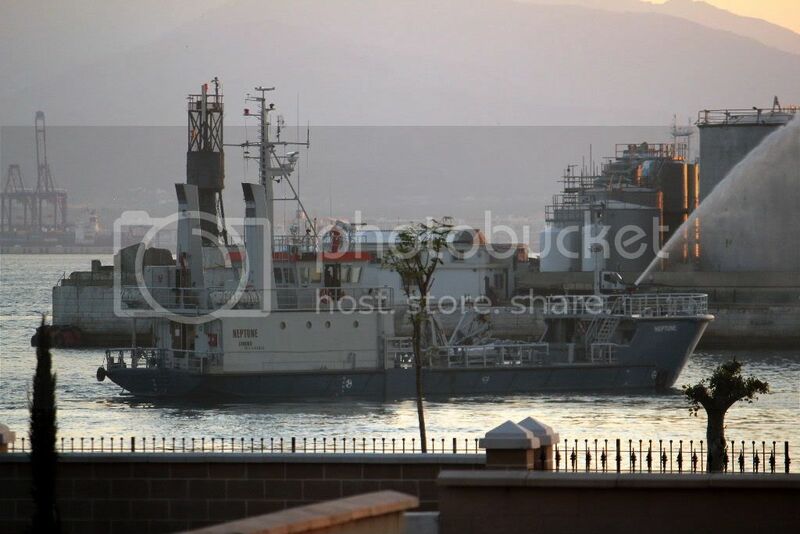 If we have moved the fuelling points to the Detached Mole, what do we do with those ships that are "in detention"? 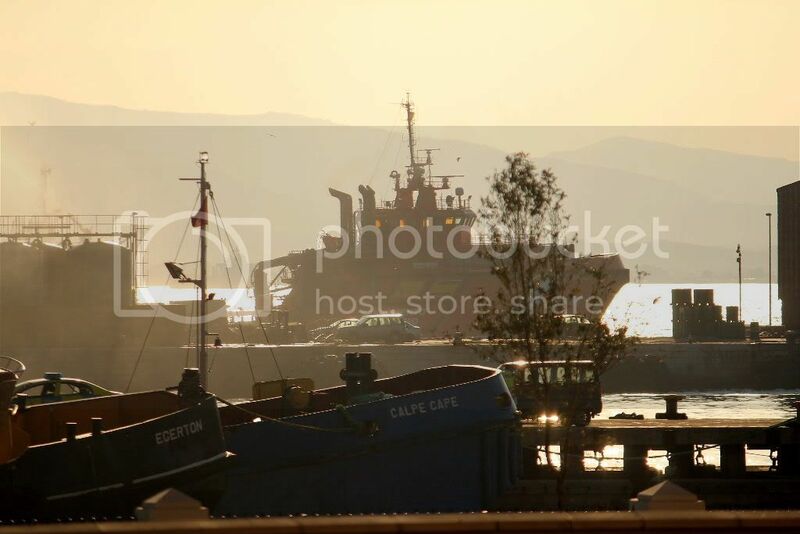 It is a well known fact that Gibraltar is much favoured for this kind of business and great faith is placed on the Admiralty Marshal and its workings. Do we dispense with this? So what are we left with? The South Mole still has 2 x Z Berths plus another berth. The other MoD berth is across the harbour by The Tower. The rest of South Mole as indeed the old berths further South of The Tower plus the docks are now in the hands of Gibdocks Ltd. Furthermore, H&S does not permit certain vessels (cruise ships?) on South Mole next to "heavy industry" as described with three docks to capacity and adjacent workshops. As I write, the first of exploratory meetings to assess the damage and prepare for the Inquiry are taking place. Certainly the overall Port facilities and methods of working will now come under the microscope. At the same time they will also evaluate the Emergency Services' resources for such an incident that cannot compare with largely land based domestic fires. Pollution control will also feature . Bunkering within the anchorage will be discussed and will put into perspective the idea of extra bunkering on the East Side. 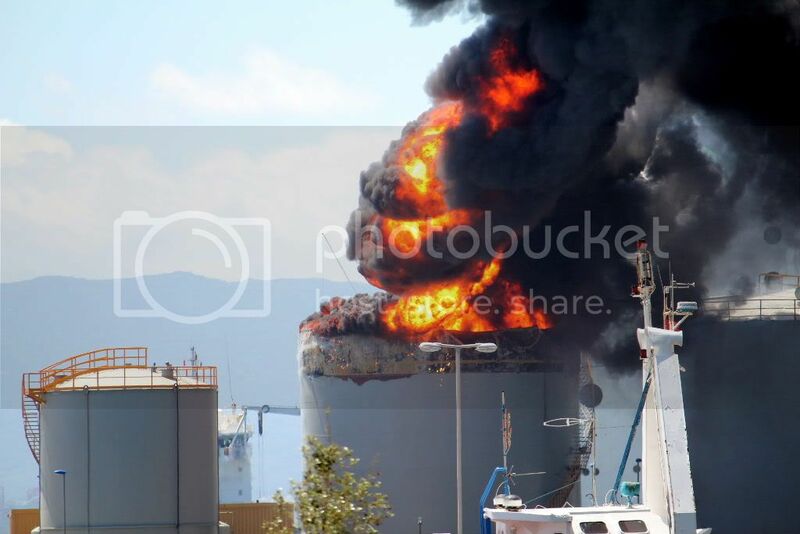 Are we fully prepared for a major incident following a fire at sea or a collision between two vessels? The first lesson to be learned is that this incident has been a wake-up call and no effort should be spared to ensure that we are ready for practically anything, albeit relative to the business conducted. There can be no complacency. To turn a blind eye or play the financial card will be a disaster in itself. We do so at out peril. Last edited by Francis GIB on Sun Dec 25, 2011 5:50 am, edited 1 time in total. But as far as I know nothing happens all those years before and there where many! I nowhere can read something about how this could happens? I think that is more important then shifting ships to another mole! Okay, passengers vessles so close to a bunkering station is another thing you can have questions, but why exploded that tank? Not because there was a vessel nearby I suppose? Is there anything known yet, because that is a fact of interesting for me! 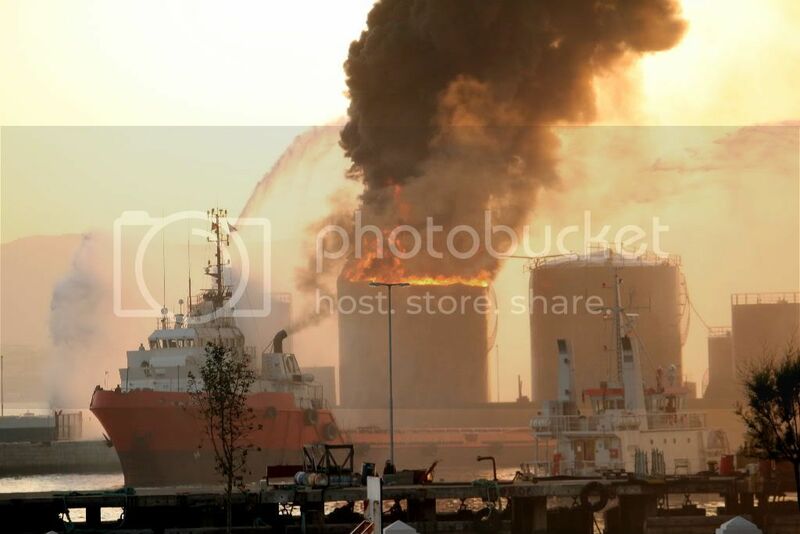 Hi Henk, initial reports said ( and nothing more has come out since as we are undergoing a parallel inspection/enquiry/report by a local team and one from UK) that there was a person welding on top of the tank that exploded. Indeed, this person was burned very badly and is in a specialist burns unit in a hospital in Seville, Spain. His condition is still critical but stable. The obvious questions are how or why welding was being carried out on a tank, there being other tanks in the vicinity. We shall have to wait for the inspection/inquiry to complete and report to the Government. Thereafter we should be getting a public report on what happened and how was it handled. As you will appreciate, there are going to be many questions on the subject, more far ranging than just dealing with the incident. Indeed, there are indications that a complete review of the Port, resources and activities will take place. The piece that I wrote is just a personal opinion based on comments and what little I know. In other words, a case of SEEN & HEARD! Thanks Francis. You know, one of my friends is still working where I did and there are many tanks. So he is very curious if such an accidents happens somewhere! 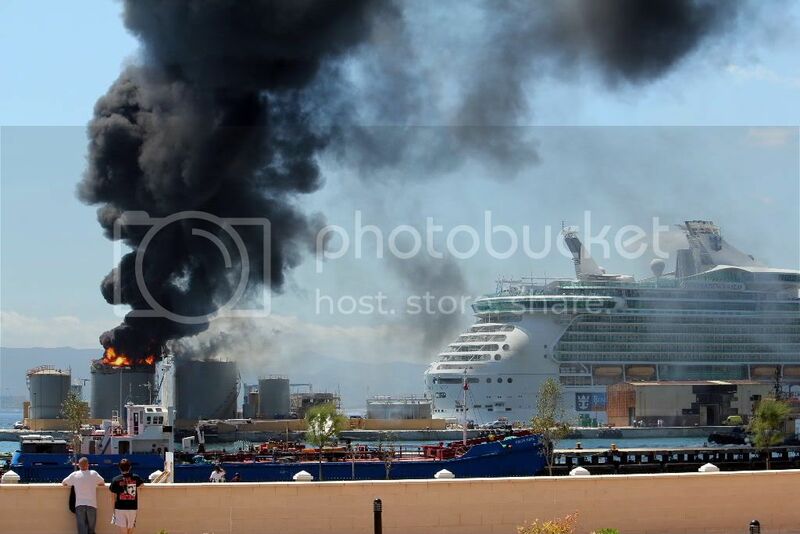 140611:INDEPENDENCE OF THE SEAS came in today and berthed exactly where she was berthed two weeks ago when the Sullage Tank exploded. The Chief Minister went on board and spoke to the Captain on the events and of the intentions to convert the Western Arm exclusively for cruise ships. During the ship's stay, the Captain personally thanked another set of heroes, namely the rope handlers (at the stern) who very bravely stood their ground in very difficult conditions ready to let go or cut the ropes for the ship to effect an emergency departure from the area. In less than five minutes the ship was released of its berthing ropes and made her way out of immediate danger . In the first few frames, if you look closely at the second tank, you will see two figures stumbling to get away down the tank's stairway. 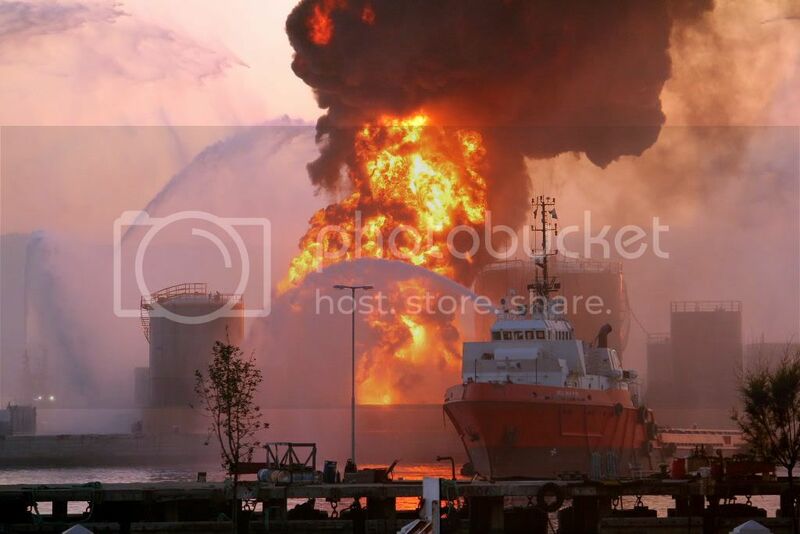 These were the two workers employed on welding albeit on the second tank and not the one that exploded. The injured person is still on the critical list in the burns unit in Seville. 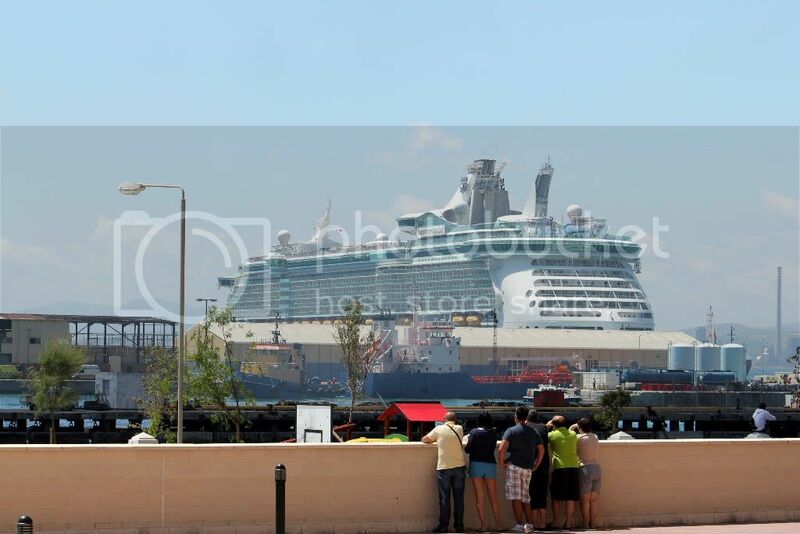 The INDEPENDENCE OF THE SEAS back in port on the 14th June as my dad stated in the previous post.